The PhD student Margherita Bettinelli, of the Instituto de Astrofísica de Canarias (IAC) and the University of La Laguna (ULL), together with an international team of astrophysicists has recently discovered an unusual astronomical object: an Einstein ring. These phenomena, predicted by Einstein's theory of General Relativity, are quite rare but scientifically interesting. The interest is sufficiently strong that this object has been given its own name: the "The Canarias Einstein ring". The research was carried out by the Stellar Populations group at the IAC, led by Antonio Aparicio and Sebastian Hidalgo. The results were published in the international journal Monthly Notices of the Royal Astronomical Society. An Einstein ring is a distorted image of a very distant galaxy, which is termed "the source". The distortion is produced by the bending of the light rays from the source due to a massive galaxy, termed "the lens", lying between it and the observer. The strong gravitational field produced by the lens galaxy distorts the structure of space-time in its neighbourhood, and this does not only attract objects which have a mass, but also bends the paths of light. When the two galaxies are exactly aligned, the image of the more distant galaxy is converted into an almost perfect circle which surrounds the lens galaxy. The irregularities in the circle are due to asymmetries in the source galaxy. The chance discovery was made by Margherita Bettinelli when she was examining data taken through the "Dark Energy Camera" (DECam) of the 4m Blanco Telescope at the Cerro Tololo Observatory, in Chile. While working on her doctoral thesis, she was analyzing the stellar population of the Sculptor dwarf galaxy and noticed the peculiar morphology of the Einstein ring. This quickly raised the attention of the members of the group and they started to observe and analyze its physical properties with the OSIRIS spectrograph on the Gran Telescopio CANARIAS (GTC). 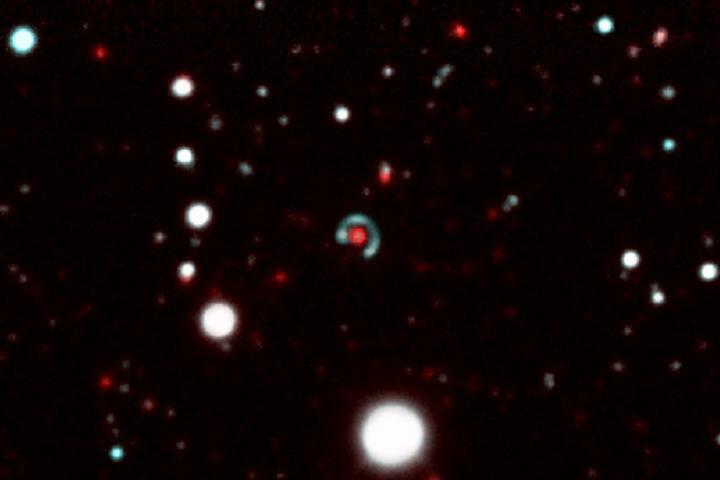 This "Canarias Einstein ring" is one of the most symmetrical discovered until now and is almost circular, showing that the two galaxies are almost perfectly aligned, with a separation on the sky of only 0.2 arcseconds. The source galaxy is 10,000 million light years away from us. Due to the expansion of the Universe, this distance was smaller when its light started on its journey to us, and has taken 8,500 million years to reach us. We observe it as it was then: a blue galaxy which is beginning to evolve, populated by young stars which are forming at a high rate. The lens galaxy is nearer to us, 6,000 million light years away, and is more evolved. Its stars have almost stopped forming, and its population is old. "Studying these phenomena -says Antonio Aparicio, one of the IAC astrophysicts who is leading the resarch-, gives us especially relevant information about the composition of the source galaxy, and also about the structure of the gravitational field and of the dark matter in the lens galaxy".